This card contained 5 matches. In the first match, Tosh Togo defeated John Bull. 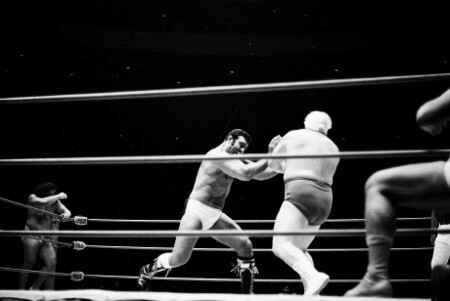 Kenji Shibuya and Pepper Gomez wrestled to a draw. Peter Maivia and Billy White Wolf wrestled to a draw with the team of Freddie Blassie and Ripper Collins. 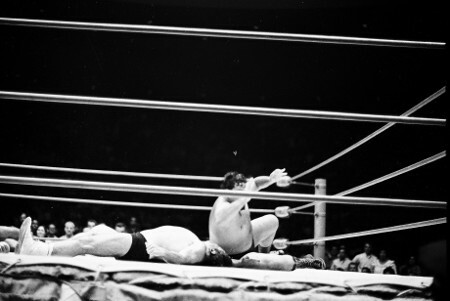 Kenji Shibuya bears down on Pepper Gomez. 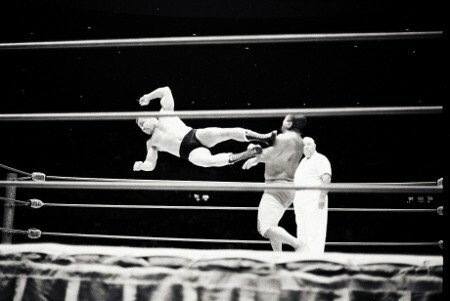 Pepper Gomez dropkicks Kenji Shibuya. 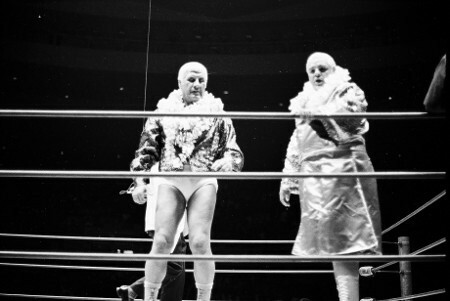 Fred Blassie and Ripper Collins after ring intro. Chief Billy White Wolf punishes Blassie. Ripper Collins slams White Wolf's head into the corner turnbuckle. Ripper Collins with an arm lock on White Wolf. Jean Antone defeated Betty Nicalli in the featured women's match. Betty Nicalli vs Jean Antone. Jean Antone has Nicolli in a headlock. Referee Frank Merril gets caught between the two wrestlers. 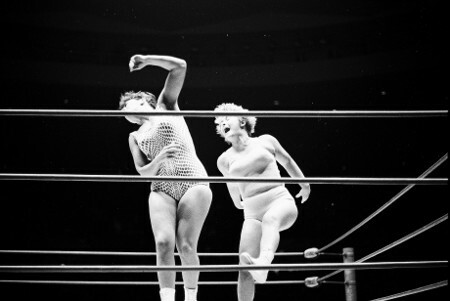 Betty Nicalli and Jean Antone collide in the middle of the ring. Jean Antone takes a breather on the ropes. The main event was for the Hawaiian Tag Team Championship. Johnny Barend and Magnificent Maurice defending their titles against the team of Jim Hady and Curtis Iaukea. This match was one of the few times Iaukea wrestled as a fan favorite. 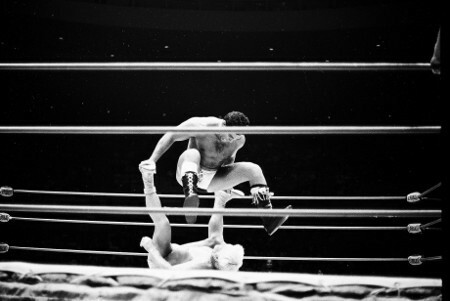 In June of 1968, Iaukea and Ripper Collins lost their Hawaiian tag team titles to Peter Maivia and Billy White Wolf. 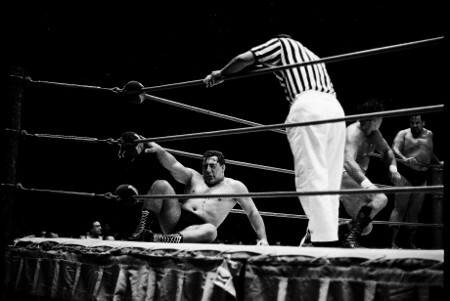 After the match, Iaukea was attacked by Collins and Magnificent Maurice. In early July of that year, Johnny Barend was coming off a two month suspension and Iaukea asked Barend to team with him to get even with Collins and Maurice. Barend refused and teamed with Maurice to defeat Maivia and White Wolf for the tag team titles. Iaukea then asked Jim Hady to be his partner to get even with Barend and Maurice. Valet Friday Allman in the ring after Barend loses the first fall. The Magnificent Maurice has Jim Hady down near the corner as Barend readies his knee. Curtis Iaukea attacks both Barend and Maurice. Jim Hady delivers a smash to a stunned Barend. As for the match itself, Iaukea pinned Barend for the first fall. Barend and Maurice won the second fall to even up the match. In the third fall, Hady was being worked over by Barend, Maurice, and their valet Friday Allman in their corner. 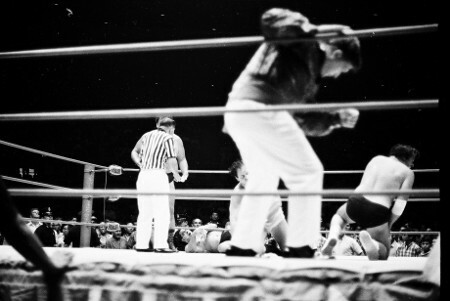 Iaukea entered the ring to help Hady and was stopped by referee Wally Tsutsumi. This angered Iaukea who threw the referee to the mat and the referee disqualified Iaukea's team, thus giving Barend and Maurice the third fall. After the match, Hady was carried from the ring a bloody mess. 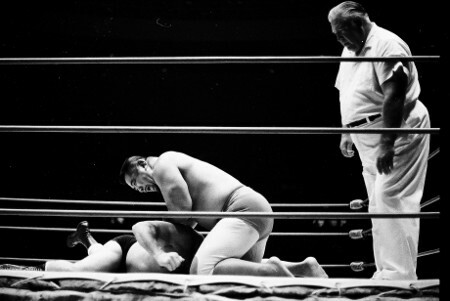 Curtis Iaukea about to cover the Magnificent Maurice. Jim Hady bleeds in the corner while Barend confronts Iaukea.